Frequent Stomach Upsets? Look into your Refrigerator! 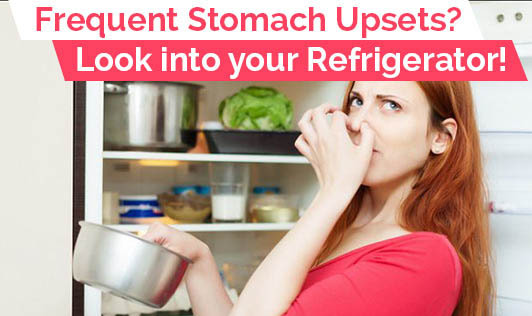 Your stomach health depends on how clean your refrigerator is! Your refrigerator is the storehouse of all the perishable foods that you eat. So, it is absolutely necessary that you keep your fridge clean to avoid any food - borne illnesses. How often do we clean it? Let's be honest. Most of us clean it only when it is visibly in need of a rub. We don't even realize how unclean and unhygienic our refrigerator is. Make it a weekly affair or at least clean it up fortnightly. The bacteria that flourish on the shelves of your refrigerator may not be seen, but can be very dangerous. Especially if you have a baby at home, be extra careful. To start your cleaning regiment, remove all the food from your fridge, remove the shelves too. Clean the interiors of the fridge with a mild liquid soap, and then wipe it with a wet cloth. Wash the shelves with soap. Let the fridge and shelves get dry. Get rid of food that has been there for more than 5 days. This process will not take more than half an hour, if you do it on a regular basis. By keeping it clean, you keep your family safe! Remember, a hygienic fridge is a hub for all your food to stay healthy. But, an unhygienic fridge is the hub for an array of harmful bacteria that can play havoc on your health.